Correlation is used to measure strength of the relationship between two variables. It can be positive, negative or zero. The correlation coefficient may take on any value between +1 and -1. A correlation matrix is a table showing correlation coefficients between sets of variables. Each random variable (Xi) in the table is correlated with each of the other values in the table (Xj). 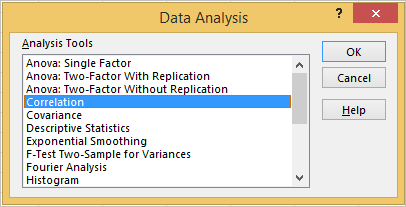 In this tutorial we will learn how to create correlation table or correlation matrix in Excel. 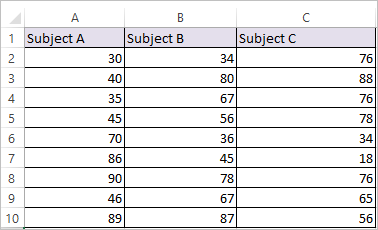 Let’s use the marks of three subjects (which is shown below) to compute Correlation matrix in excel. Step 2: Select Correlation and click ok.
subject A and Subject B are positively correlated and correlation coefficient is 0.2267.